– Heat a swirl of olive oil in a pan. When the oil is hot add the leeks and sauté until they start to soften. Add the cream and let it bubble a bit until the leeks are tender, adding salt and pepper to taste. Add the dill, toss, and take off the heat. Add a squeeze of lemon juice and stir. Taste and adjust seasoning. Set aside. – In another skillet heat a couple of glugs of oil. Sprinkle salmon fillets with salt and pepper. When the oil is hot add salmon to the pan skin side down (my fillets here were already skinned but I still cook the side where the skin was first). Cook for a couple of minutes and flip to cook the other side. Cook for a couple of minutes more until done to your liking. – Place each fillet on a plate and divide the creamy leeks between the two. – Serves two. Salmon is nice when it’s a little rare in the middle, but cook it all the way through if that’s how you like it. The great thing about fillets, as opposed to steak cuts, is that you can actually see the fish cooking on the sides (as the fish grows opaque from the bottom up). This makes is easier to predict when the fish is done. Since neither salmon nor creamy sauces make it to C’s list of favorites this is something I often enjoy when he is not around. I actually love these little meals made solely for my enjoyment. Brings me back to the early days of my cooking — when I cooked only for myself, and ultimately fell in love with it. Which brings me to another nice attribute of the fillet…it lends itself perfectly to the single serving! Note: I am trying to groom little C to be a creamy-salmon-dish-eater just like her mama. To make a baby friendly version just steam the salmon and leeks, cut up/mash when cooked (leeks should be soft and salmon cooked through), and mix with a dollop of yogurt (instead of cream). I’ve also done a version with the salmon steamed with cilantro and onions, then mashed with yogurt when cool. Definitely thing I would eat myself! Oh yum! This looks absolutely delicious! I love leeks! This looks absolutely delish!!! 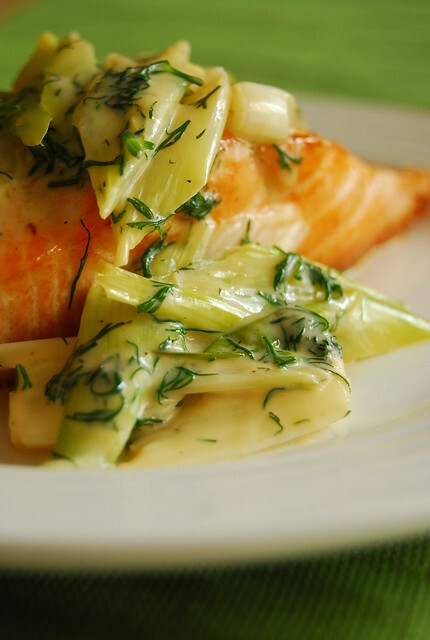 I love the flavor of leek and I bet it was just perfect with the salmon! Sounds delightful Joey and a lovely photo. I gasped when I saw this post! I absolutely love salmon dishes; and your combination of leek and a creamy sauce sounds delicious. Perfecly thought out and a beautiful snap. Delish! And lucky Little C! Hi Brittany! Thanks for your kind words! Hi Ling! It’s a snap to make too! The salmon dish looks lovely! I like to cook with fillet better since my husband can’t take bones!! Oh, the salmon looks like a beautifully hewn chunk of coral! I can imagine how heavenly it must've tasted! That looks delicious. I have been trying to eat less meat and carb lately so this is a perfect dish for me if I can resist the urge to have starch with it… potatoes, bread, etc. And your photo is gorgeous! Yum! Too bad I just used the last of our salmon from the freezer…We had a record sockeye run here in BC and it was all salmon all the time! I'll definitely try this next time I have salmon in the house! Hi Midge! You made my salmon sound so poetic! Looks amazing, yummy. I love your blog! 1.) I don't think I've ever had a leek in my life. 2.) I fell in love with cooking when I was cooking only for myself as well. I love simple, healthy food like this dish, Joey – you're making me crave fish at 9:15 in the morning, sweetie! Wow great I stumbled unto this blog! Really awesome recipes and very well told! Great photos! Nice to see someone who appreciates the art as well! P.S. I LOVE BREAKFAST TOO! Hi Carlos! Thanks for dropping by and leaving a comment 🙂 Glad to meet another breakfast lover! I wonder if you could use Greek Yogurt instead of cream to make it healthier. Made this tonight! Was so awesome! My husband (who is nhead chef at a popular Atl restaurant) made comments that I needed to add shallots and garlic to the sauce after seeing the recipe. I didn’t add them and he loved it! Said it was simplicity at its best.